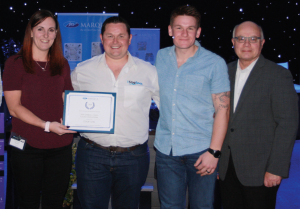 Marquis Spas dealers from the UK, Scandinavian regions, and mainland Europe, gathered recently for their annual dealer training event, followed by an awards ceremony held at the Heart of England Events & Conference facility in the Midlands. Members of the Marquis Spas team joined dealers in a celebration of record breaking sales while hearing about new product developments and promotions for 2019 and beyond. 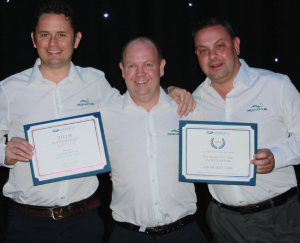 At the Awards, the 1 Stop Spas team picked up the award for Top Overall Sales and Top Selling Parts in the UK at the same time adding an Outstanding Performance Award. Outstanding UK Performance Awards also went to Complete Spas and Barnsley Hot Tubs. 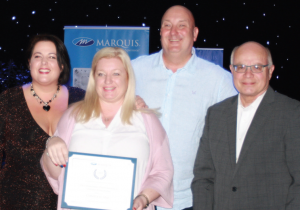 The Welsh Hot Tubs team were pronounced top dealers in the UK and received a ruby level Top Producers Award. The Dealer of Distinction Award and Top European Sales went to Europe Spa and Top New Customer went to World4Spas Many individual dealers were awarded the distinction of Top Producers while retailers Société Kopec, Mon Spa and Spassion, of France, together with Borg Hytee & Spa of Norway were awarded Outstanding Performance Europe awards. ABOVE: Steve Baxter and his Welsh Hot Tubs team were celebrating as top UK Marquis dealers. 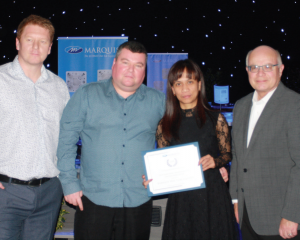 ABOVE: An Outstanding UK Performance Award for Marquis Spas selling team, Complete Spas. ABOVE: The high flying One Stop Spas team added three Marquis awards to their trophy cabinet.